Believe it or not, it all started in a high school weight room. We were grinding every day in our pole vault training, on and off the track when we were dubbed “The Gale Force Twins”. Before we get into it, here is a quick explanation of exactly what Gale Force means. The term Gale Force comes from The Beaufort Wind Scale, created by Britain’s Admiral, Sir Francis Beaufort. This wind scale was one of the first scales created to estimate wind speeds based on a series of values (Beaufort’s numbers) starting from zero for calm winds and up to twelve for hurricane winds. Each value has its own description of the effects along with a classification of wind velocity. The Gale Force wind holds it’s place in Beaufort’s numbers 7, 8, and 9, ranging between 28 and 47 knots or 32 and 54 mph. The descriptions for these values are a Near Gale, Gale, and Severe Gale. We looked at each other, both thinking, “wow that’s a really cool name.” At the time neither of us knew it would really stick around. What started as something inventive and quick thinking, slowly grew into more than just a name. We carried it with us through high school sports, college, and now into the fishing industry where we believe it has found it’s true home. As kids, we were always a boating family. The first center console our family had was named “Gale Force”. A few years later the “Gale Force Girls” was purchased. This is where the two of us did much of our training. 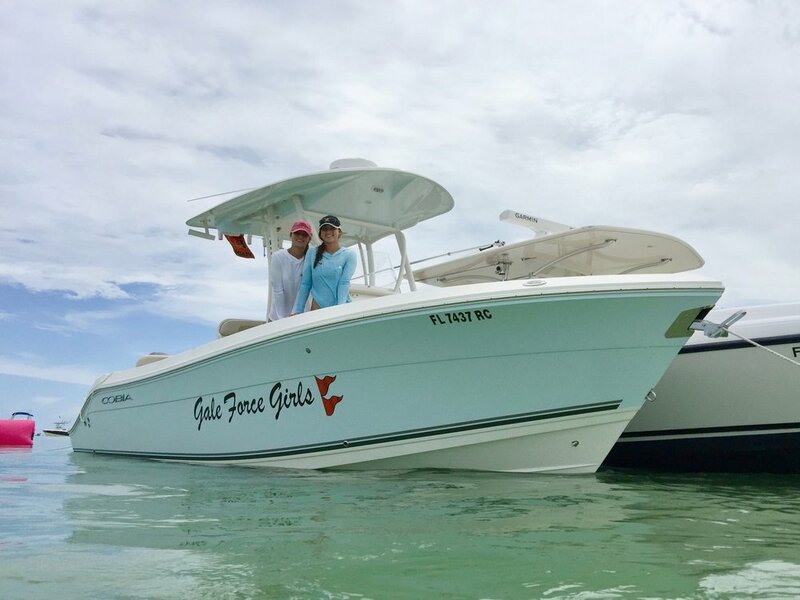 The perfect boat to learn, run shallow at the sand bars, or even head offshore in search of tuna or mahi. Following the 23’ Cobia, we took our first jobs offshore where The Gale Force Twins grew and began to learn vast amounts about the charter boat industry! Several jobs and gigs later (including captains license courses and a college graduation) both of us started working as independent contractors for the Two Conchs fleet of Yellowfin’s. We did not hesitate when we opened our first LLC. It was a unanimous agreement to be Gale Force Twins LLC! Emily taking steps to becoming an independent contractor! Amanda at the Monroe Country Tax Office doing her due diligence! It’s amazing that one person can have such a big impact on your life, and you don’t even realize it until many years later. We have Coach Mark Deeb and the rest of the Calvary track and field staff to thank for that!